This tech-recipe is aimed more for those who work in a corporate IT environment. I will explain how to setup a batch file to install and deploy the Novell Client for Windows 7 and create a Novell Client Properties file. This recipe will be useful for Novell Client deployments and/or setting updates. This technique should work for Vista, Windows 7, and Windows Server 2008. The Novell Client is required to connect to Netware and OES servers and file systems. Thankfully, Novell understands that most of us have to deploy their Novell Client to a large number of workstations and in turn has created several tools and command line options to make this deployment much easier. We will basically be creating a Novell Properties file and then calling the setup.exe with the file as a flag. I plan to outline how to create the Novell Properties file and also give a few ways you can deploy the client and the settings using several different techniques. Lets get to it! 2. Run the .exe to extract the files. Be sure to uncheck the “Run setup.exe after extracting”. I also changed the location to where it extracts the files to C:\Testing\Novell Client 2 SP1 Windows (IR5). These utilities allow us to create the customized Novell Property files that contain our client settings (ie preferred server, login options, disable/enable features in the client, etc). 4. Run nicman.exe (for 32bit windows) or nicman64.exe (for 64bit windows). 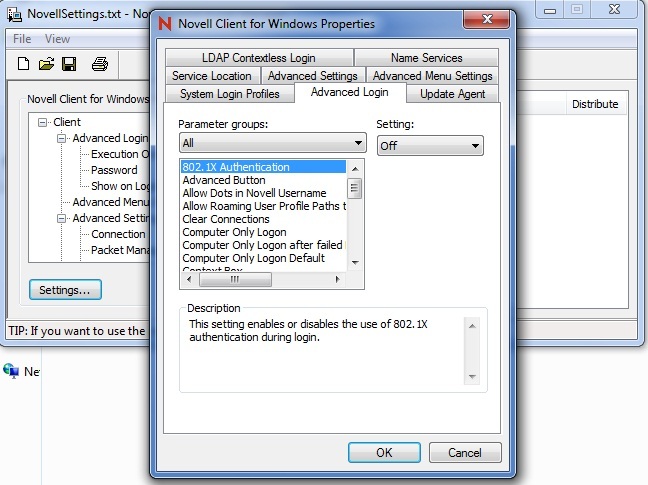 You can then setup the Novell Client settings per your company / network setup. Once you have made all of the changes, go to File > Save and then save file as a text (.txt) file. 5. There are two ways you can deploy the Novell Client and settings. Either via a command line and batch file or you can install using the setup.exe (however we will need to modify the Install.ini file with this method, notes at the end on this). We will focus on the command line / batch file method. ii. Create a notepad text file in the same folder as setup.exe and the above file, call it install.txt and then rename it to install.bat. v. Now copy the contents of the install folder (ie C:\Testing\Novell Client 2 SP1 Windows (IR5)) to a test machine and try running the install.bat to see if it will install your Novell Client w/the settings we provided earlier! – Deployment will require the user account running .bat file to have Administrator rights. – When imaging or creating an image, you can install the Novell client in the image and then later copy the Novell Properties file to the deployed machine and again run setup.exe w/the appropriate properties file. This will just update the settings, very handy if you have multiple networks / subnets and multiple property files.